"Strength for today, hope for tomorrow"
side of Oklahoma City. We celebrated 100 years in 2013. Sarah (Kelham) Bath, wife of real estate developer Vincent Bath, saw the need for a Sunday School for neighborhood children, and that became Kelham Baptist Church. She began a Sunday School in her home around 1911 to reach children in the neighborhood of Kelham Avenue and NE 13th in Oklahoma City. This church grew from that small beginning. In 1955, the church moved from Kelham Avenue to NE 36th and Staton Drive, taking in Park Estates, a mission of First Baptist Church of Oklahoma City. Several years before the church moved, it spent almost $250,000 (in 1954 dollars—multiply by 10 for current value) renovating the faciliities because Pastor Anson Justice believed a church of some kind proclaiming the gospel of Jesus Christ would be there. He was correct: those facilities currently house Avery Chapel, AME. 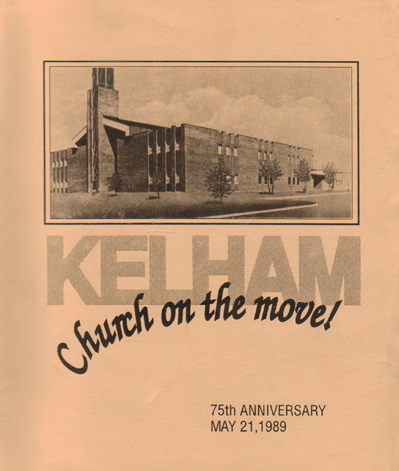 In the late 1960s, Kelham moved to the northwest side of Oklahoma City, merging with Utah Avenue Baptist Church. The two buildings the church had constructed on NE 36th and Staton Drive currently house two different Baptist churches. Kelham Baptist Church is a place you can call home. Our music is traditional (we sing hymns from hymnbooks) not because we are old-fashioned but because hymns powerfully emphasize historic truths of our faith. The community of God's people singing is a powerful testimony. Our preaching is expositional (we explain the Bible and apply its teachings to our lives today). Our church family is warm and welcoming. "Strength for today, bright	hope for tomorrow"